Quick reminder that tonight is Sound Transit’s latest open house to discuss the latest phases of light rail construction on Capitol Hill. The forum comes as work is set to begin on shoring up portions of Interstate 5 in preparation for tunneling that will begin in the area after this summer. The work will close the Olive Way exit from northbound I5 for the next year. We’re still collecting questions to pass along to Sound Transit so leave a comment if you aren’t able to attend tonight but want to be heard. Also expect the recent news about sinkholes developing in the area of Beacon Hill’s light rail tunneling to be on people’s minds. Pulling together a CHS post on that later today. Tonight’s meeting runs from 6 to 8p at Seattle Central’s room 1110 in the south end of the main building. Construction is now underway on University Link, a 3.15 mile light rail line extension that will connect downtown Seattle, Capitol Hill and the University of Washington. In early 2011 the tunnel boring machine that will construct the light rail tunnels between Capitol Hill and downtown Seattle will start digging south from Capitol Hill. Before it reaches the Pine Street area in late 2011, Sound Transit must prepare the ground under I-5 for the arrival of the tunnel boring machine. The construction contract to complete this work will require the temporary closures of the Olive Way off-ramp from northbound I-5, the Cherry Street on-ramp to northbound I-5 and the Pike/Pine reversible HOV ramp to the I-5 express lanes. 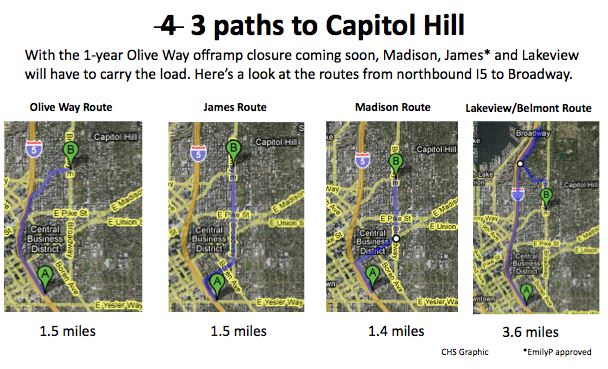 * The Olive Way off-ramp from northbound I-5 will be closed for about one year starting as early as May 18, 2009. * The Cherry Street on-ramp to northbound I-5 and one lane of northbound I-5 will be closed for about four weeks as early as May 26, 2009. This ramp will also close for about four weeks in Spring 2010. * While the Cherry Street on-ramp is closed, the Cherry Street entrance to the I-5 express lanes from 5th Avenue will be open to all traffic (currently only open for HOV). * The Pike/Pine reversible HOV ramp from the I-5 express lanes will be closed for about one year starting in mid-June 2009. Buses will still be able to access the Downtown Seattle Transit Tunnel. Sound Transit is working closely with the Washington State Department of Transportation, the City of Seattle and King County Metro to plan detours. During the year long closure a signed detour route will be in place. Drivers will exit to Madison Street and turn left on Boren Avenue to reach Olive Way. A major effort to educate drivers about the detour routes and construction status is underway. You’re still disregarding the James St. exit. Any particular reason? James is a tougher street to travel because of its steepness and uneven pavement, but it’s always been an option. Turn east onto it and go a few blocks, then left onto Broadway, then continue wherever. I usually turn right again onto Madison. Updated! I was surprised to see how it measured out — thought it was longer distance. Now that the construction has officially started, it looks like people are passing James Street and continuing straight through Hubbell Place by the Convention Center to get to Pike Street. I live on 9th & Union, which was once a quiet, tucked away corner, now has become the official Olive Way off-ramp detour route. My street is insane now. Is this why the commute across Montlake (from UW/University Village area) to the I-5 entrance just past the Montlake bridge, has been GRIDLOCKED for the past few days? It took me an hour to get through! I could have walked faster!